2 | Oncology Advances Genitourinary cancer researchers at Dana-Farber/Brigham and Women's Cancer Center (DF/BWCC) are investigating novel therapeutics and drug combinations that may circumvent the development of resistance to targeted therapies in patients with metastatic or recurrent renal cell carcinoma (RCC). Of the more than 330,000 people worldwide diagnosed with RCC annually, approximately one-third present with metastatic disease at the time of diagnosis. In addition, approximately one third of patients with localized disease at diagnosis will eventually experience relapse. 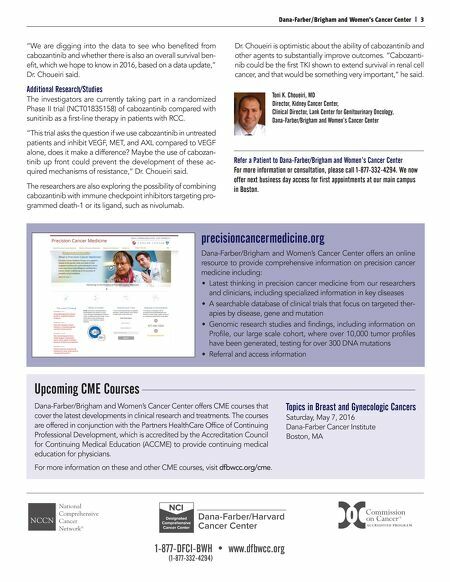 "One of the great unmet needs is for patients who progress on first-line treatment. 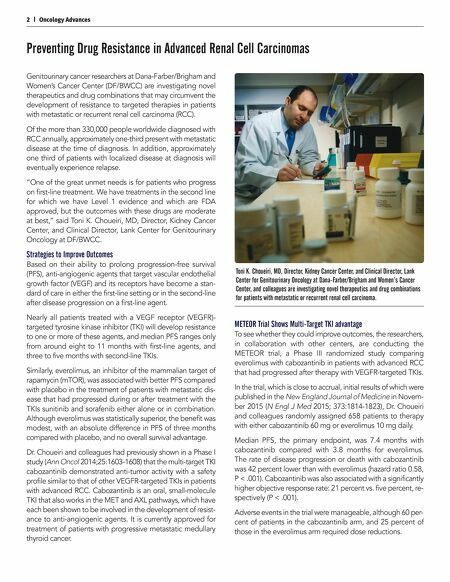 We have treatments in the second line for which we have Level 1 evidence and which are FDA approved, but the outcomes with these drugs are moderate at best," said Toni K. Choueiri, MD, Director, Kidney Cancer Center, and Clinical Director, Lank Center for Genitourinary Oncology at DF/BWCC. Strategies to Improve Outcomes Based on their ability to prolong progression-free survival (PFS), anti-angiogenic agents that target vascular endothelial growth factor (VEGF) and its receptors have become a stan- dard of care in either the first-line setting or in the second-line after disease progression on a first-line agent. Nearly all patients treated with a VEGF receptor (VEGFR)- targeted tyrosine kinase inhibitor (TKI) will develop resistance to one or more of these agents, and median PFS ranges only from around eight to 11 months with first-line agents, and three to five months with second-line TKIs. Similarly, everolimus, an inhibitor of the mammalian target of rapamycin (mTOR), was associated with better PFS compared with placebo in the treatment of patients with metastatic dis- ease that had progressed during or after treatment with the TKIs sunitinib and sorafenib either alone or in combination. Although everolimus was statistically superior, the benefit was modest, with an absolute difference in PFS of three months compared with placebo, and no overall survival advantage. Dr. Choueiri and colleagues had previously shown in a Phase I study (Ann Oncol 2014;25:1603-1608) that the multi-target TKI cabozantinib demonstrated anti-tumor activity with a safety profile similar to that of other VEGFR-targeted TKIs in patients with advanced RCC. Cabozantinib is an oral, small-molecule TKI that also works in the MET and AXL pathways, which have each been shown to be involved in the development of resist- ance to anti-angiogenic agents. It is currently approved for treatment of patients with progressive metastatic medullary thyroid cancer. Preventing Drug Resistance in Advanced Renal Cell Carcinomas METEOR Trial Shows Multi-Target TKI advantage To see whether they could improve outcomes, the researchers, in collaboration with other centers, are conducting the METEOR trial, a Phase III randomized study comparing everolimus with cabozantinib in patients with advanced RCC that had progressed after therapy with VEGFR-targeted TKIs. In the trial, which is close to accrual, initial results of which were published in the New England Journal of Medicine in Novem- ber 2015 (N Engl J Med 2015; 373:1814-1823), Dr. Choueiri and colleagues randomly assigned 658 patients to therapy with either cabozantinib 60 mg or everolimus 10 mg daily. Median PFS, the primary endpoint, was 7.4 months with cabozantinib compared with 3.8 months for everolimus. The rate of disease progression or death with cabozantinib was 42 percent lower than with everolimus (hazard ratio 0.58, P < .001). Cabozantinib was also associated with a significantly higher objective response rate: 21 percent vs. five percent, re- spectively (P < .001). Adverse events in the trial were manageable, although 60 per- cent of patients in the cabozantinib arm, and 25 percent of those in the everolimus arm required dose reductions. Toni K. Choueiri, MD, Director, Kidney Cancer Center, and Clinical Director, Lank Center for Genitourinary Oncology at Dana-Farber/Brigham and Women's Cancer Center, and colleagues are investigating novel therapeutics and drug combinations for patients with metastatic or recurrent renal cell carcinoma.